and your method of installation can slightly de-tune the antenna. Also, DO NOT forget to extend all telescopic sections! 1. If you received pretuned antenna extend the two telescopic sections until black marker rings show. If you are retuning extend the antenna as shown below (loosen screws and extend the 2 telescopic parts). 3. If you received antenna pretuned, do not loosen gamma rod yet. Only do it later if SWR isn't perfect. with a little effort. Now set the rod so that it is about 1/3 in the black gamma match tube. you can reduce range later when you get close to the frequency of choice. 6. Press OK to start measurement. The curve minimum needs to be close to zero at the desired Frequency. 7. Change the length of the antenna until you get best SWR at desired frequency. 8. Change gamma rod position until you get best SWR at desired frequency. 9. Repeat 7 and 8 until you get minimal SWR reading possible. 11. Check SWR again. If needed, correct. The KIT version has all the difficult to make small parts, the only thing missing are the long metal poles in the middle (see photo). By not including these antenna becomes much cheaper to ship plus you have the pleasure of putting this antenna together by yourself which is a bonus for many people. The antenna in KIT form is already cheaper, but the real savings come from shipping as the KIT is much much cheaper to ship. - Option 2: you can also use three shorter telescopic aluminum poles, 1120mm (1000mm if you are operating at 100-108MHz) each, the thick one 40mm diameter, the other two must slide inside. - You may need a saw to cut a slit in the aluminum poles so it can be fastened with a clamp. If you buy factory finished telescopic pole this may be included. 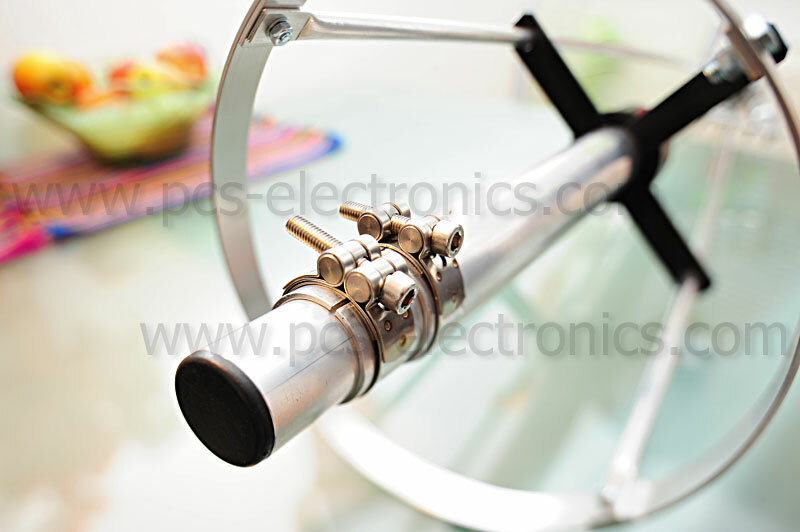 - You may also need clamps to fasten the telescopic sections, any hardware store has those. If you buy factory finished telescopic pole this may be included. The improved gamma in model mark II is our idea.